Andrews, P. 1996. Palaeoecology and hominoid palaeoenvironments. Biological Reviews of the Cambridge Philosophical Society 71:257-300. Arnason, U., A. Gullberg, A. Janke, and X. F. Xu. 1996. Pattern and timing of evolutionary divergences among hominoids based on analyses of complete mtDNAs. Journal of Molecular Evolution 43:650-661. Benefit, B. R. 1999. Victoriapithecus: The key to old world monkey and catarrhine origins. Evolutionary Anthropology 7:155-174. Benefit, B. R. and M. L. McCrossin. 1997. Earliest known Old World monkey skull. Nature 388:368-371. Caccone, A. and J. R. Powell. 1989. DNA divergence among hominoids. Evolution 43:925-942. Collard, M. and B. Wood. 2000. How reliable are human phylogenetic hypotheses? Proceedings of the National Academy of Sciences (USA) 97:5003-5006. Cowlishaw, G. and J. E. Hacker. 1997. Distribution, diversity, and latitude in African primates. American Naturalist 150:505-512. Gibbs, S., M. Collard, and B. Wood. 2000. Soft-tissue characters in higher primate phylogenetics. Proceedings of the National Academy of Sciences (USA) 97:11130-11132. Goodman, M., D. A. Tagle, D. H. A. Fitch, W. Bailey, J. Czelusniak, B. F. Koop, P. Benson, and J. L. Slightom. 1990. Primate evolution at the DNA level and a classification of hominoids. Journal of Molecular Evolution 30:260-266. Harrison, T. 1987. The phylogenetic relationships of the early catarrhine primates: A review of the current evidence. Journal of Human Evolution 16:41-80. Harrison, T, and Y. M. Gu. 1999. Taxonomy and phylogenetic relationships of early Miocene catarrhines from Sihong, China. Journal of Human Evolution 37:225-277. Rae, T. C. 1999. Mosaic evolution in the origin of the hominoidea. Folia Primatologica 70:125-135. Raaum, R. L., K. N. Sterner, C. M. Noviello, C. Stewart, and T. R. Disotell. 2005. Catarrhine primate divergence dates estimated from complete mitochondrial genomes: concordance with fossil and nuclear DNA evidence. J. Hum. Evol. 48: 237–257. Ruvolo, M. 1997. Genetic diversity in hominoid primates. Annual Review of Anthropology 26:515-540. Steiper, M. E., N. M. Young, and T. Y. Sukarna. 2004. Genomic data support the hominoid slowdown and an Early Oligocene estimate for the hominoid-cercopithecoid divergence. Proceedings of the National Academy of Sciences (USA) 101(49):17021-17026. Stewart, C. B. and T. R. Disotell. 1998. 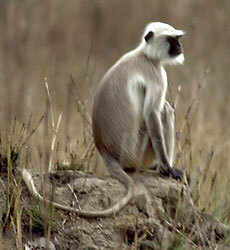 Primate evolution - in and out of Africa. Current Biology 8:R582-R588. Young, N. M. and L. MacLatchy. 2004. The phylogenetic position of Morotopithecus. Journal of Human Evolution 46(2):163-184. 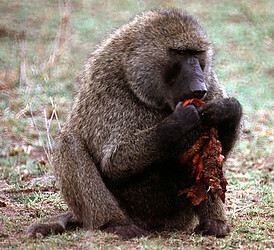 Baboons occasionally kill and eat mammalian prey. In this case the source of the meat was unknown.